There are loads of woodlands in Britain where you can have a free family day out this summer. 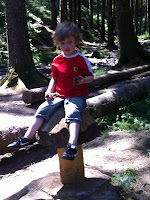 On the hottest day of the year we went to Cardinham woods near Bodmin in Cornwall. They have barbeque's and picnic benches so that was lunch sorted. There is a river running through the woods that was great for the children to splash about in to cool off and the trees provided a bit of cover so no one got sunburn. Blake loves collecting fir cones and spotting different creatures. 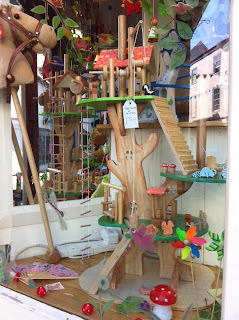 I then went in to the shop and brought a little bit of the Forest with me by setting up a woodland themed window display. I'm a big fan of toadstools, like the one Blake found to sit on. 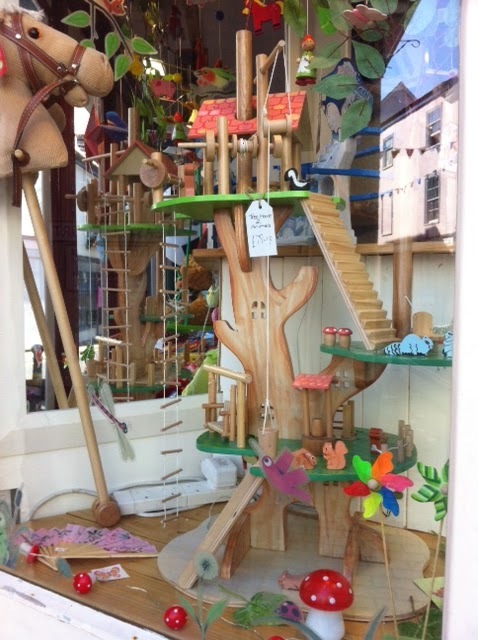 The wooden tree house you can see in the picture comes with little wooden toadstools as well as woodland animals. It really is a beautiful toy that both boys and girls love. It's not on the website yet but we only have 36 and once they are gone they're gone. 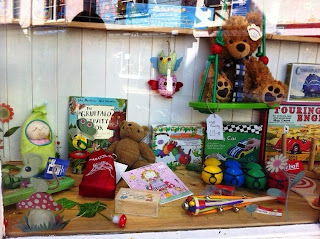 Our toadstool night lights and toadstool fairy lights brighten the window up and night. I have also used Djeco meadow wall stickers in and around which features birds, rabbits, flowers, toadstools and other countryside images. I love these and would use them in Blake's room if he didn't already have a pirate bedroom. There are lots of my favorite new products in the window including the fairy on a toadstool birthday puzzle card which is from our range of jigsaw puzzle cards and the hanging owls which as everyone who knows me knows, I love them.